BPX5 Series 8-axis 5-linkage precision and high-efficiency tool grinder is suitable for manufacturing circular or non-circular cutting tools of 3-16/25mm in IT, automobile, aviation, medical, woodworking, polycrystalline CBN and other metal cutting tools industries. Yes. The machine tool can be equipped with Peiping Patent's automatic feeding and unloading and anti-collision system, precision clamping mechanism and innovative tool precision support system. BPX5 series 8-axis 5-linkage precision and high-efficiency tool grinder is suitable for the production of 3-16/25mm circular or non-circular cutting tools in IT, automotive, aviation, medical, woodworking, polycrystalline CBN and other metal cutting tool industries. The machine tool can be equipped with Peiping Patent’s automatic feeding and unloading and anti-collision system, precision clamping mechanism and innovative tool precision support system. 1. Extensive extensibility and innovative intelligent tool grinding operation programming interface. 2. 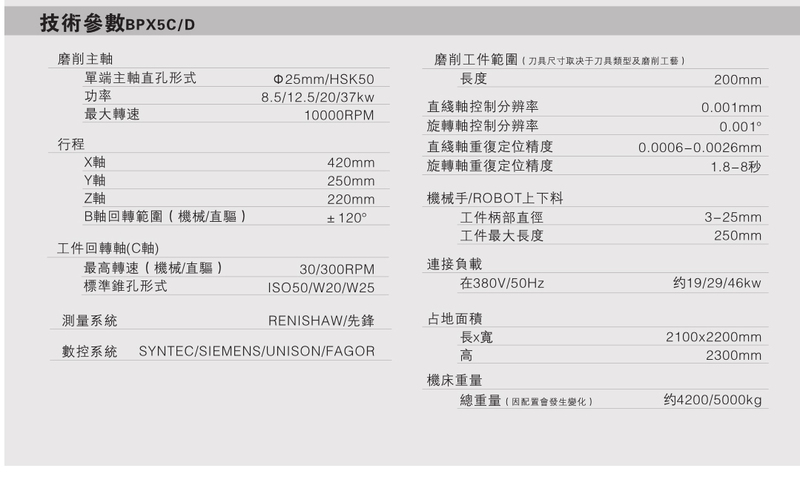 The workpiece swing axis (B axis), workpiece spindle (C axis) and X/Y/Z linear axis can choose direct drive/linear motor. The Heidehan/Renishau grating ruler greatly improves the accuracy of the machine tool. 3. Choosing marble bed can resist earthquake and reduce the influence of low temperature change. For batches of long and short cutters, maximizing the operation time and unrivalled production capacity and the shortest start-up time makes the grinder an ideal machine for large-scale production of high-precision cutters. 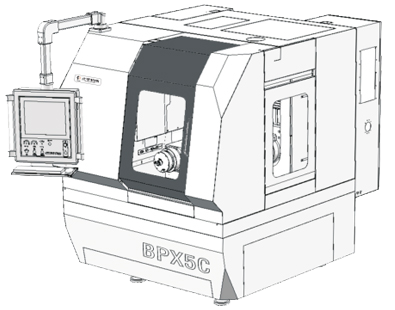 BPX series CNC grinders can be equipped with European or American 3D tool grinding software. The technology of Beiping Intelligent Chemical Plant can realize the automatic production of grinding, automatic detection, laser marking and other process integration, and can carry out real-time data acquisition for remote diagnosis.